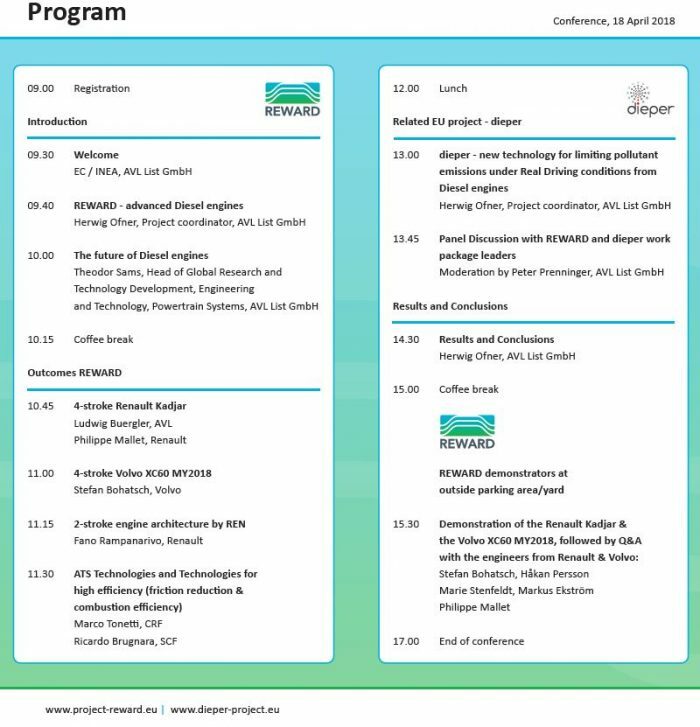 The Real World Advanced Technologies for Diesel Engines (REWARD) Project is almost completed and we are happy to announce a final stakeholder event together with the dieper project in order to show final REWARD results as well as first (dieper) results. The dieper project is almost midway. We would like to share the REWARD innovations, the results we have achieved in both projects, and our vision for the future of diesel engines at the Transport Research Arena 2018 which will be held from 16-19 April 2018 in Vienna, Austria. We would like to present our new 4-stroke B/C class Diesel engine as well as our 4-stroke D/E class Diesel engine, the new EATS tested on our vehicles and optimized for new combustion concepts, give information on activities related to low-friction materials and lubricants, and new driveline components that have been designed specifically for the demonstrator vehicles. We invite you to discuss with us our engineering activities. This is an open event (free of charge) taking place as official side event to TRA2018. In case you wish to be kept informed about the event, please also register with Ms Ilse Claassen i.claassen@uniresearch.com by sending your name and surname. Under the heading of “A digital Era for Transport”, the Transport Research Arena 2018 (TRA 2018) will explore, discuss and demonstrate major paradigm shifts specifically directed at important areas of our life, such as transport, mobility, logistics and industrial production. TRA 2018 will be special not only because of an outstanding programme, new formats and hands-on demonstrations, but also because Vienna provides a variety of possibilities to enhance your stay beside the conference. Find out more about cultural events, green spots in Vienna, and also the contrast of historic and new architectural highlights. To read more about the TRA 2018, please click here.